Soyuz 2-1b rocket lifts off on Sunday, October 2, 2011, from the Plesetsk Cosmodrome in northern Russia. This story was updated at 12:51 p.m. EST. A Russian communications satellite crashed just after liftoff Friday (Dec. 23) when its rocket apparently failed, the latest in a series of rocket launch failures for the country this year. An unmanned Soyuz-2 rocket launched the Meridian military communications satellite from Plesetsk Cosmodrome in the Russian northern region. But the rocket failed to reach orbit, making it the fifth failed space mission for Russia in 2011. "This area of the space industry is in sort of a crisis," Russian space agency chief Vladimir Popovin told reporters in a televised press conference today. "We can say even now that the problem lies in the engine." But more analysis is needed to be certain exactly what went wrong, he added. The capsule ferried three new crewmembers to the space station, boosting the outpost's crew size to six for the first time since September, when it dropped to three people due to delays caused by another failed Russian rocket launch in August. "I believe that tomorrow we'll have more results that we'll be able to tell you," Popovin said during today's press conference, which was held in Russian and translated on NASA TV. Popovin and other space officials left the conference after several questions about the launch failure despite a reminder that the briefing was targeted at the successful docking. The Soyuz-2 rocket crashed near the city of Tobolsk in Siberia, the Russian news agency Ria Novosti reported. The Soyuz-2 rocket is an upgraded version of the country's typically dependable Soyuz booster. 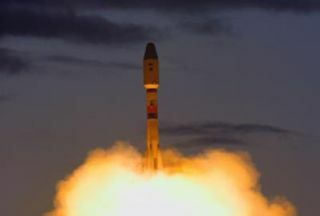 Russia's space launch troubles this year began in February, when a Rokot launch vehicle failed to deliver a military satellite called Geo-IK2 into the proper orbit. On Aug. 18, a different rocket design, called Proton, also delivered its $300 million satellite payload into the wrong orbit. Less than a week later, a third-stage engine problem doomed yet another rocket launch, this time a Soyuz booster carrying the robotic cargo ship Progress 44, which crashed somewhere in Siberia instead of making a routine delivery flight to the International Space Station. It was this failure of Russia's normally dependable Soyuz rockets that forced Russian and U.S. space officials to ground all Soyuz flights — including crew launches to the space station — until after a full investigation could be performed. Russia resumed Soyuz rocket launches in late October with the launch of a new unmanned Progress cargo ship. Two manned Soyuz space missions followed, mid- November and most recently on Dec. 21, to bring the space station back to its full six-person crew size. But on Nov. 8, Russia was dealt another space setback when the country's first Mars-bound spacecraft in decades failed to leave Earth orbit. The Phobos-Grunt mission aimed to land a probe on the Mars moon Phobos, collect samples of the moon and return them to Earth. The spacecraft also carried a Chinese Mars orbiter. But Phobos-Grunt has been trapped in Earth orbit for more than a month and is expected to plunge back to Earth by Early January. According to Ria Novosti reports earlier this month, Russian president Dmitry Medvedev has even threatened to disciplinary action, heavy fines or criminal penalties for the country's recent space woes. In December 2010, Medvedev formally reprimanded Anatoly Perminov, the previous chief of Russia's Federal Space Agency, and outright fired two other high-ranking space officials. Popovin said an investigation into the failure will be performed in order to develop measures to fix any flaws in the Soyuz-2 rocket engine. The next launch of a Russian-built rocket is slated for Dec. 26, when a Proton rocket is scheduled to launch a communications satellite from the Baikonur Cosmodrome in a mission overseen by the U.S.-based firm International Launch Services. The Proton rocket is a different design than the Soyuz-2 booster. Another Soyuz rocket, this one managed by the European launch provider Arianespace, is scheduled to launch on Dec. 28.